Central banks across the advanced world have been on an unprecedented easing spree post the 2008 crash. As of today, most of them are exploring uncharted territory of negative rates + QE. One central bank - Bank of Japan (BOJ) particularly stands out since it is fooling around with Near Zero Interest Rate (NIRP) policy since late 90s. As we can see from the chart above, BOJ's easing cycle appears to have begun in early 90s and has remained stuck at near zero rates. Moreover, it has never had a meaningful tightening cycle. The BoJ moved to negative rates on Jan 29; a move that wasn't well received by financial markets. It is quite a fact that despite near zero low rates for more than a decade, the Japanese economy is still flirting with recession. Stock markets see a surge every couple of years but appear unattractive avenue on long term basis. However, economic growth is still anaemic across the globe, inflation remains low and there is a threat of a so called deflationary spiral. Meanwhile, labor poll continues to shrink across the advanced world. 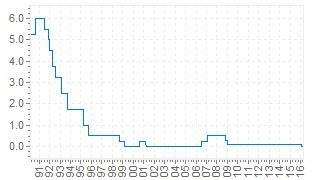 So low rates have clearly not worked. Debt levels continue to increase across these nations, while a weaker currency is doing little to import inflation or boost exports. Bank of Japan left key rates unchanged last week and is unlikely to cut rates further or increase QE for now. In literal sense, the central bank of Japan could cut rates and/or increase QE; however, these easing methods have lost its effectiveness. The problem is that rates have stayed at record lows for a long time and QE has been initiated and also expanded across the globe at regular time intervals. Thus, law of diminishing marginal utility/returns seems to have come into effect. We believe negative rates are nothing but reflection of the fact that the marginal efficiency/marginal utility of rate cuts/QE has hit the negative territory. Positive economic impact of interest rate cuts is a big matter of debate between Austrians and Keynesian economists. We here would consider only the impact on markets and it is quite clear that markets do not respond positively to rate cuts and QE. 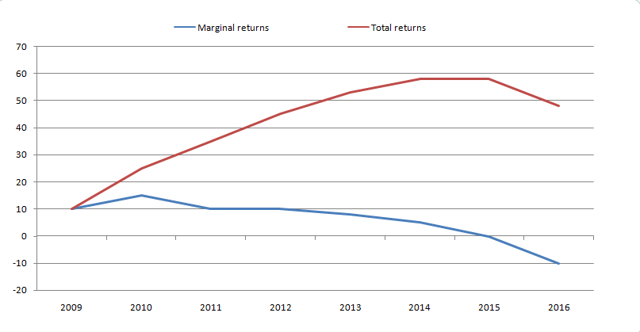 Moreover, the equation is negative marginal returns/utility = Negative interest rates. Negative marginal utility of rate cuts indirectly means highest marginal efficiency of rate hikes. So even a single rate hike would be able to destabilise the markets. On the other hand, further rate cuts are now being met with increased selling in stocks. Plus it is worth noting, that rate cuts and the resulting rally in equities may not add to economic growth, but sell-off in equities surely does pull economic growth lower. Market forces are eventually gaining an upper hand over central banks. Falling prices/slowing economy is an inevitable part of the economic cycle, and rate cuts/QE won't be able to avoid it. They may postpone it the way they have done in the last few years, but eventually market forces score a victory. The state in which the Bank of Japan is in today is a warning to other central banks - ECB, SNB, BOE, Fed etc. Moreover, banks started competing aggressively with each other in a race to loosen the monetary policy from late 2014 onwards. Consequently, the law of DMU acted. If central banks wouldn't have competed so aggressively with each other.. the resulting time gap between rate cuts/QE would have kept marginal utility/returns of rate cuts intact. Given the low aggregate demand in the world economy and high debt levels, low rates are likely to stay here, however a bout of policy tightening is necessary in order to avoid losing the effectiveness of low rates/QE completely. Once the effectiveness is lost, it indirectly means market would react negatively…something that central banks do not want. Don't be surprised if Fed hikes rates in June or later as it is not a matter of choice but a compulsion. If not rate hikes, the Fed is indeed likely to be on a long-term status quo.